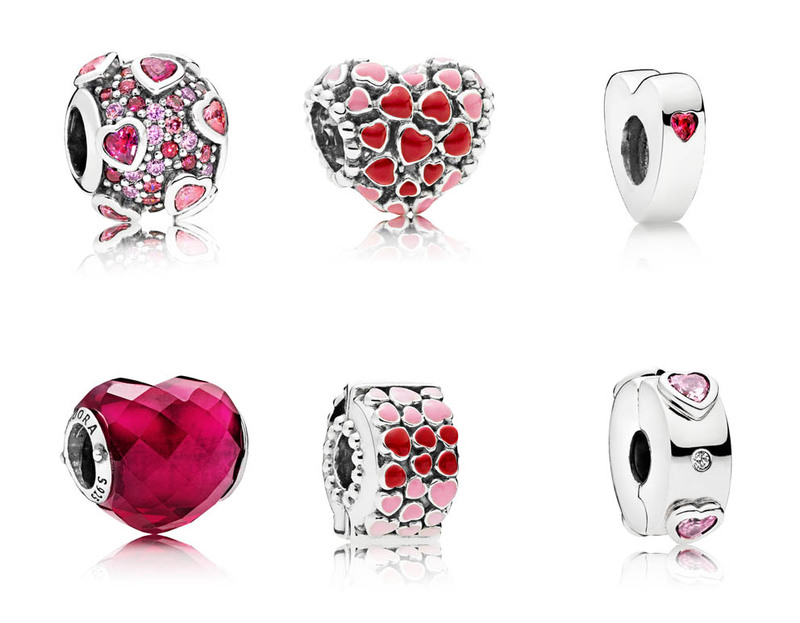 Get ready to get romantic- the Pandora Valentine’s Day mini-collection is here! This year’s new additions include some classic styles mixed in with some colorful new additions with a whimsical style. The new collection includes pieces in every category, including a new bracelet concept. Check out our review below! 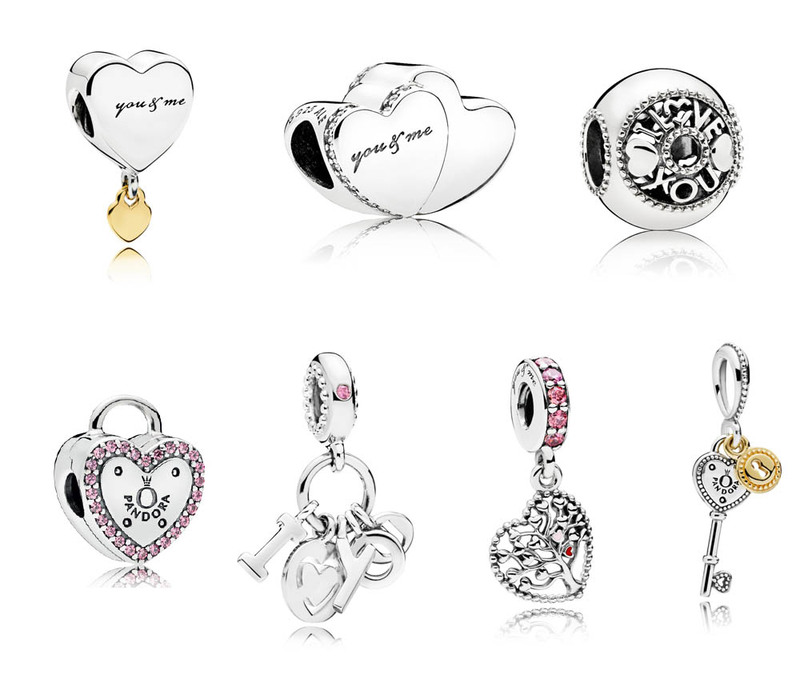 The centerpiece of Pandora’s Valentine’s Day collection is a selection of new charms in wide-ranging styles. The main focuses of this year’s campaign include a beautiful lock and key motif, the encouragement to “kiss more” with kiss themed pieces, and saturated color in bright fuchsia and salmon-pink. The first group of charms are bursting with color. Many of the enamel charms have an ombre effect with graduating color from the edges to the sides. 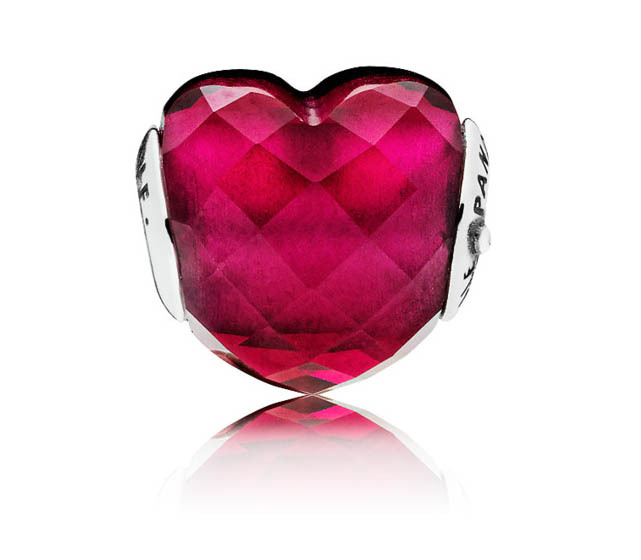 We particularly love the new Shape of Love charm, which features a faceted rose crystal. Included in this grouping is the new innovative spacer shaped like a heart, a new standard clip, and a new silicone grip clip. The next grouping is a whimsical interpretation of the idea that we should “Kiss More.” We love the details in the emoji style Kiss charm- it has glitter cerise enamel on the lips and hearts along the edge. 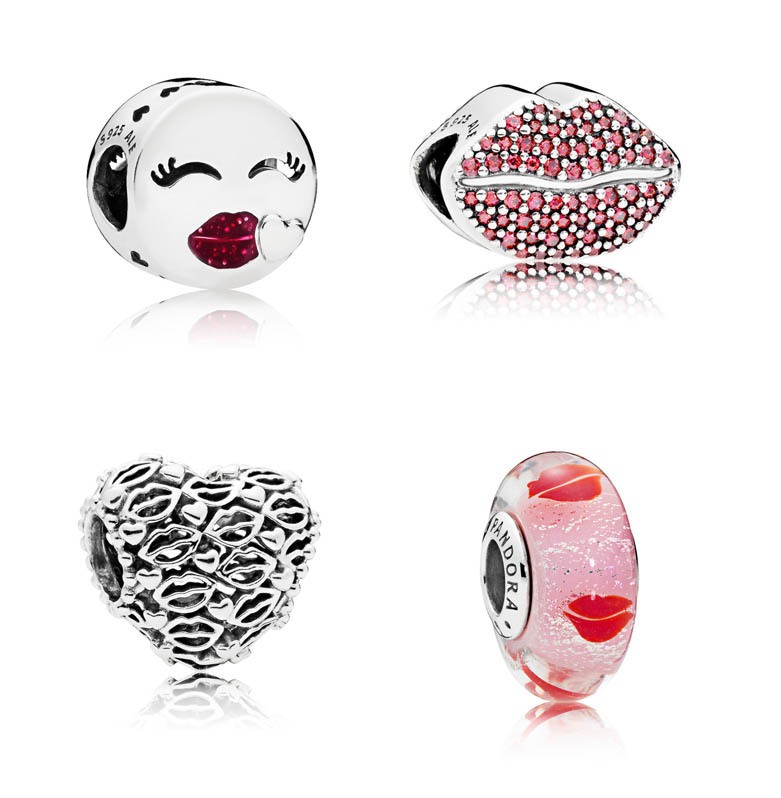 The lips charm is a limited selection at the moment. The last grouping appeals to the more classic style, with touches of gold accenting bright silver. 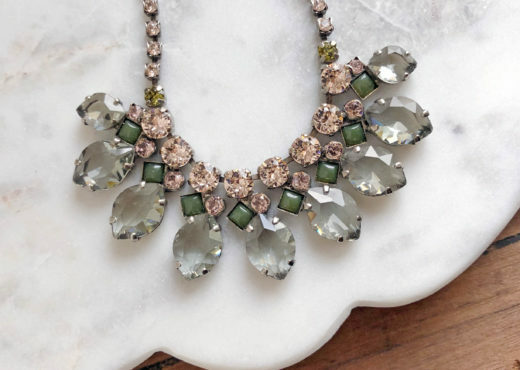 Light pink cubic zirconia give a touch of romantic color. 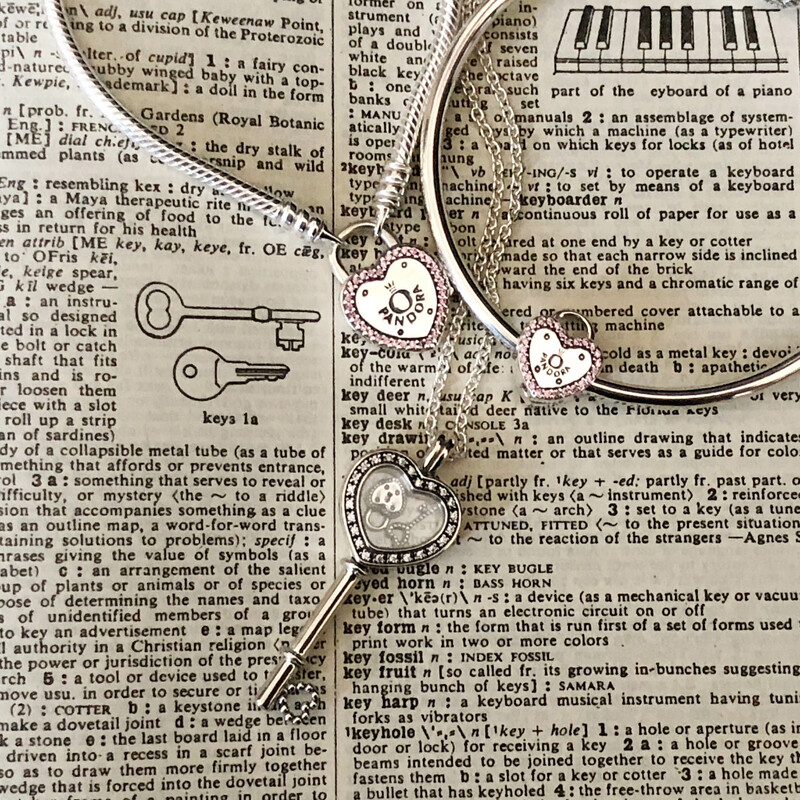 The lock and key symbols and the “You & Me” sentiment are used frequently throughout the Valentine’s collection- we really like the new key dangle charm with gold lock. There is also a new heart lock-shaped clip that makes a great statement as a bangle centerpiece. There are also a few new additions in rose. The Pandora Rose pieces in this collection are accented with a synthetic ruby. 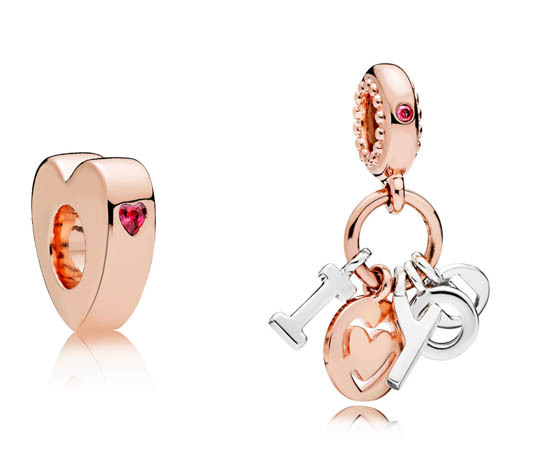 We like the mixture of the Pandora Rose and silver letters in the Rose interpretation of the I Love You charm- it is a great way to tie together a mixed metal charm collection. There is one addition to the Essence collection- a beautiful fuchsia faceted crystal charm that mirrors the Shape of Love charm in the Moments collection. The meaning behind this charm is Love- the perfect sentiment for the season. One of the most exciting parts of the new Pandora Valentine’s Day collection is the addition of a new bracelet concept. The Lock Your Promise bracelet features a new removable lock closure. We are looking forward to seeing what other similar clasps are going to become available for this concept! The Explosion of Love bracelet carries forward the bolo-style bracelet design. We like this design because it allows the wearer to adjust the size to what is comfortable to them. This sweet design has small pink CZ hearts studding the smooth silver cuff. One of our favorite new pieces in this collection is the key-shaped Memory Locket! 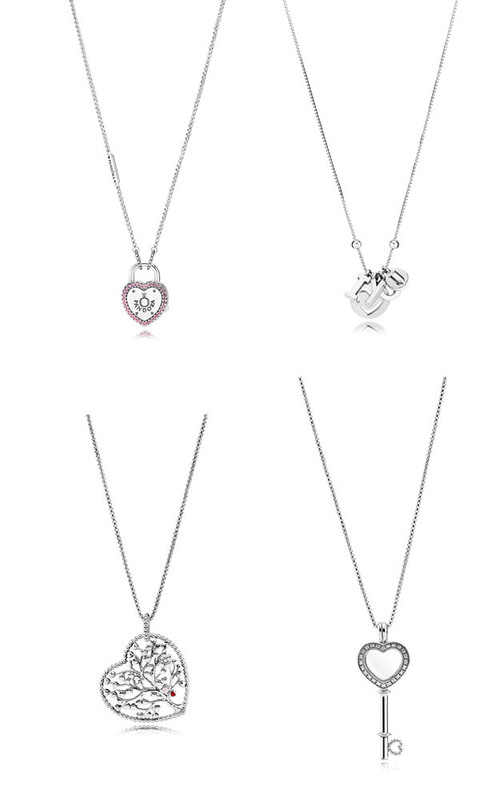 Fitting 2-3 petite charms, this locket has beautiful details and a classic shape similar to the Tiffany keys collection. There is also a lock necklace with a similar concept to the Lock Your Promise bracelet. We love the details on the Tree of Love necklace, where two colorful enamel hearts are nestled within the tree’s branches. To accompany the new key locket, there are four new Petite charms. We love the lock and key together as a pair! Pandora continues to be very innovative in their earring designs. We love seeing all of the new concepts that are being released and how we can customize them using the pieces we have at home! The new Two Hearts Hoops use a stud earring at the front of the ear that fits into the hoop in the back. Use some of your other Pandora studs to change the look of the earring! We also adore the sweet Love Locks studs. With the short dangle of the heart lock, they offer a little more than the traditional small stud. On to one of our favorite categories- rings! There are only a few additions to the rings in this year’s collection, but they are beautiful. 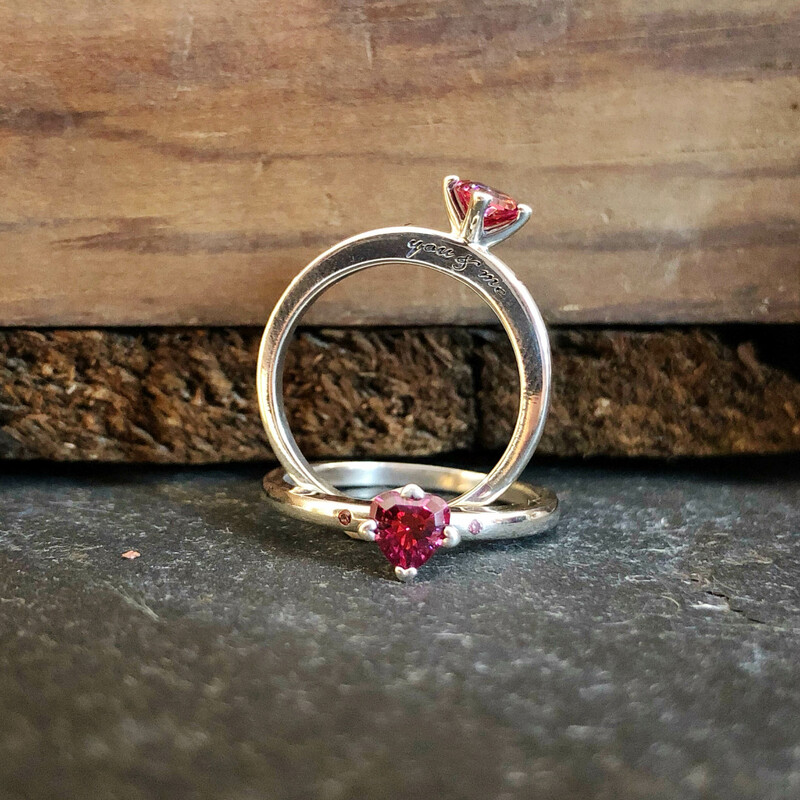 The open-style Two Hearts rings are great for stacking without feeling too heavy. The You & Me ring features a heart-shaped dome cut stone that has a beautiful depth. The side of the ring is engraved “You & Me”, adding another meaningful layer. 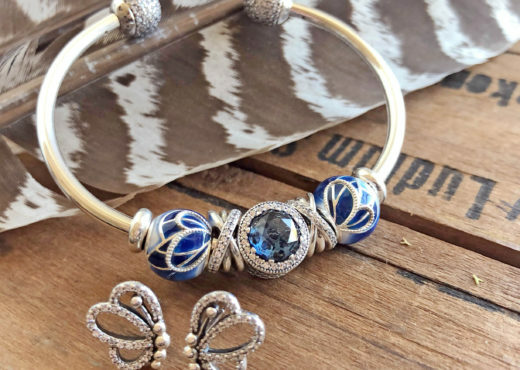 As always, Pandora has released some great value sets for the holiday. This year the sets come with some fun extras! The Kiss Me bangle gift set includes a Pandora sterling bangle engraved with “Kiss Me” in dark red enamel, the Kiss emoji charm, and a pair of Sparkling Elegance earrings- all packaged in a light pink Limited Edition box. Even better- the set comes with a light pink Limited Edition makeup bag loaded with hearts. This set offers a savings of $56 from the price of the items purchased separately. The Tree of Love bracelet set includes a Pandora sterling heart-clasp bracelet, the new Tree of Love dangle charm, and two Burst of Love clips, all packaged in the Limited Edition pink Valentine’s box. This set offers a savings of $46 from the price of the items purchased separately. The last set is the Limited Edition Kiss More Lips charm. This charm comes packages in a Limited Edition pink box and includes a free red lip-shaped coin purse! All of the gift sets come beautifully presented, making gift-giving easy this Valentine’s Day. 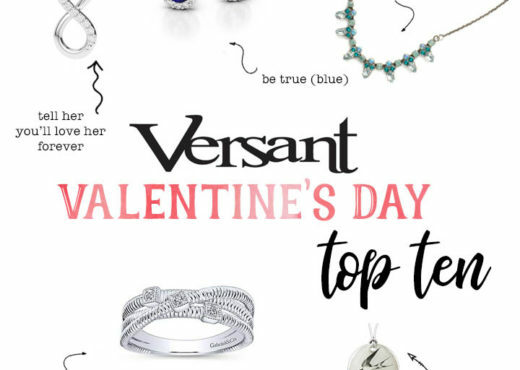 Make sure to stop by Versant to see all of the new Valentine’s Day pieces in person! 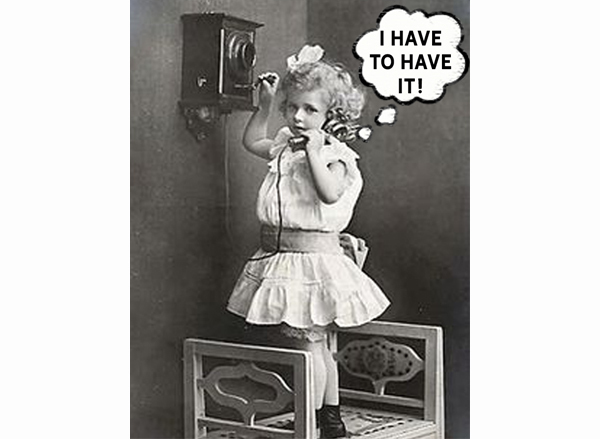 We would love to help you navigate the many charms, old and new, to create a meaningful collection to give this holiday. As always, we are very grateful to all of our wonderful customers who choose to support our local, small business.